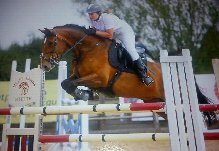 Prince is a 5 year old NF x Connemara who is used for eventing. After a fall in August Prince has been showing some signs of discomfort whilst being worked including reluctance to move forward off of the leg into canter. On my first visit to Prince he was housing tension in many of his muscles which was causing him some problems, during his first treatment Prince found it hard to relax and kept trying to evade releasing tension by moving around and eating and would not let me anywhere near his head or face. I visited Prince for the second time today and what a change he stood for his entire treatment and responded really well with lots of releases, he even let me work on his poll which was totally out of bounds last time. Prince has progressed so much (with the help of his owner Hannah doing the advised stretches and exercises) since his last treatment and I look forward to seeing him again in a few weeks to continue with the work we have started. 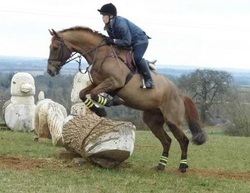 Lady is a 16.1hh TB who does lots of eventing. Her owner Holly asked me to come out and treat her to see if it would help out with the tension Lady was feeling especially present when show jumping. During the treatment I found a number of areas of stressed muscle which were causing Lady some discomfort, Lady really enjoyed the massage and relaxed into it. Since I treated Lady I have had very positive feedback from Holly regarding how Lady is now a lot happier and more willing when being worked.... Look at Holly's feedback on my testimonials page. 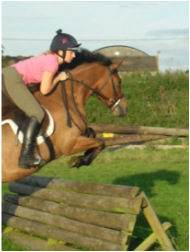 I look forward to seeing Lady again and helping her feel more comfortable through her eventing career. I went to see this beautiful mare again today and what a dramatic change since my last visit, the areas of tension which were present on my last visit had almost all disappeared with the exception of 4 which had reduced but not totally released. Today I provided Lady with a full maintenance treatment to keep her entire muscular structure relaxed I then used various techniques to help release the areas still suffering with tension, Lady showed a fantastic reaction as the rhomboid muscle (within her neck) released the tension it was housing, Lady stretched her neck and head right down as the muscle relaxed and she was able to stretch it comfortably without restriction. I believe that Lady's ridden work will again show noticeable improvement after this latest treatment and am looking forwards to my regular updates from Holly. 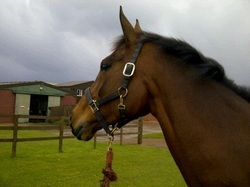 Valian is a very handsome 16.2hh warmblood show jumper. Initially when treating Valian I used some massage techniques to help him relax which meant he would receive the maximum benefit from his treatment, Valian reacted very well to the whole massage treatment and showed fantastic reactions when the tension present throughout his topline began to release. I look forward to seeing Valian again next week to help his continued comfort during his show jumping career. 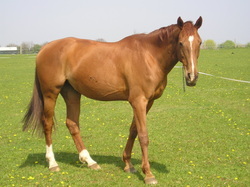 Conkers owner was the lucky winner of a free massage, Conker is a TB x who is used for eventing and had various areas of tension through his neck and withers. He loved his massage and showed great reactions when the areas of tension released, I look forward to seeing Conker again soon to keep him comfortable and help him on his way through the eventing season. 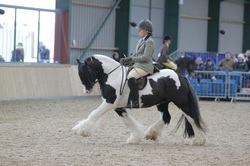 George is a traditional show horse standing at 138cm his owner contacted me as she was worried that he maybe suffering with some discomfort. I went to see George today, he really enjoyed and relaxed into his treatment especially enjoying the techniques used in areas of tension. I fell in love with George... He is a very handsom chappy! Cassidy is a TB x Arab who I first met on January 12th 2013, his owner contacted me following an injury which had caused muscular stress within his back. I have now visited Cassidy 3 times and he is showing great improvement, every time I treat Cassidy he relaxes and enjoys his treatment a little more than the last time. showing lots of positive responses to the techniques used. I look forward to seeing Cassidy again in a few weeks to help his continued recovery. Henry is a 5 year TB who is hoped will begin eventing this year, the intentions of my first visit to Henry was to introduce him to massage and stretching interactions as well as help with a reluctance to bend his neck around to the right. Henry really relaxed during this treatment and I look forward to providing him with more treatments in the future to help keep him relaxed and comfortable throughout his eventing career. Millie is a 16 year old freisian cross, her owner called me out after the vet diagnosed her with damage to the hamstring muscle on her nearside hind. Millie loved her massage and really relaxed during the techniques applied to her injured area. Once I had finished Millie's treatment her owner ran her hand over the injured area and was said the difference in the feel of the muscle was amazing. I have given Millie's owner massage techniqes to carry on with before my next visit and will be going to see her again in a couple of weeks. 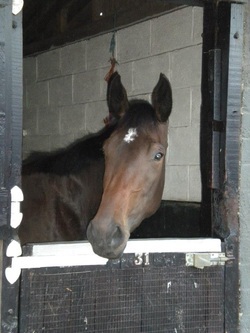 Nina is a 3.5 year old Belgium Warmblood, she is not yet backed but is lunged on a regular basis. Nina struggles to bend when working on the right rein, whilst massaging Nina it was apparent that she has various areas of muscular tension on the near side which are likely to be causing her problem, these areas were treated with a variety of massage techniques to release the fused muscle fibers. Nina also suffers with severe scaring and muscle wastage on her near side hind quarter from a incident whilst traveling aged 14 months, I began treatment on this area by using very gentle techniques to begin breaking down the scar tissue and awaken the surrounding muscles. 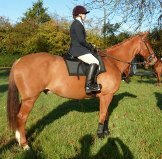 Douglas is a 6 year old Irish cob who is used for driving, show jumping, cross country, hacking and fun rides. He is generally very alert and has quite a curious nature causing him to almost always be alert with tense muscles especially through his neck. Douglas has 3 lovely paces but was struggling to strike off on the correct lead when asked to canter on the right rein. Due to the wide range of disciplines he works in Douglas had various areas of muscular stress. During his massage treatment I used various techniques to relax him and release the areas of stress. I followed the massage routine with some stretches to help with the strike off in canter. 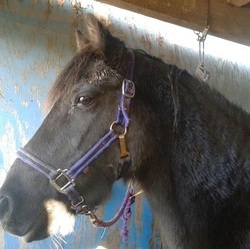 Rodney is a 5 year old new forest pony, whilst being broken to saddle Rodney had huge problems with evading his rider mounting him, he was an exceptionally tense pony and always worried about what was happening to him. His first saddle was slightly tight which had caused tension within the muscles either side of his withers, he was also showing tension through his neck and back. After a couple of massage treatments the first of which I concentrated mainly on relaxing Rodney emotionally to help him feel more at ease in his surroundings the tension had been released from the areas mentioned above. 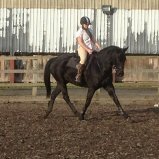 Jess is a 22 year old TB x ID, she started life as a hunt horse, then went on to be used for schooling, jumping and hacking. 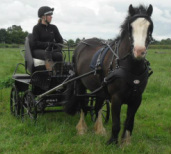 for approximately the last 6 years Jess has suffered with a lot of ill health as well as a large number of muscular and skeletal problems. Jess now receives regular massage treatments to aid the prevention of muscular tension and reduce the possibilities of further skeletal malfunctions.